To fully appreciate this work, we have to take a look at Andy Matzner’s background. He is a licensed clinical social worker, psychotherapist, and Tarot card reader. And a very accomplished writer! Put all of this together, and what do we have? An amazing book that takes the imagery of the Tarot into the real world, combining it with venues such as writing, journaling, and arts and crafts. The common denominator – creativity! We are accessing our creative center to stimulate our imagination, and to help us understand ourselves (and those around us) better. Matzner notes that the cards of the Tarot are natural be tools for developing self-awareness and personal transformation. This is a book filled with incredibly deep exercises that help the reader to understand themselves better, recognize the obstacles in their life, and work through them. The activities and exercises are divided into three sections: Conversation Starters, Writing & Journaling, and Arts & Crafts. It is all about communications, based primarily on answering a series of questions. This is the very basis of Tarot – how the question is worded determines the answer that we received. What is your reason for choosing this particular activity or exercise at this time? What special meaning might this activity have for you? What preparations do you need to make for the activity? 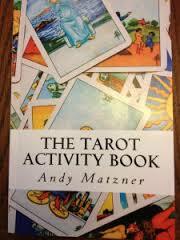 Tarot decks are discussed, along with different types of arts and crafts materials that might be needed. “Conversation Starters” covers ways in which to begin a dialogue, whether with yourself or with others. Some of the topics presented her include Relationships, The Hero’s Path, Self-development, Pain Management, and Free Association. For instance, Free Association asks the reader to pick a card at random from their deck, and place it face down. When the reader is ready, they turn the card over and write down whatever word or phrase comes to them. “Writing & Journaling” uses the Tarot to explore our inner world, and our creative ability. One of the activities in this section helps the reader create well thought out questions. Matzner suggests that a well thought out question can: challenge assumptions, shift one’s perspective, stimulate self-reflection, stir a hidden part of one’s soul, provoke change, generate energy, and create more questions. Other topics in this section include Inner Child dialogues, Letter To Parents, Facing Your Inner Critic, Soul Card, Finding Compassion, Healing Symbol, and Trauma Stand-In. Each topic is formatted for Objective, Background, and Process. “Art is a way to experience emotions and to express them. “Arts & Crafts” features projects that act as therapy for encouraging self-discovery, fostering personal growth, and promoting healing. The format is the same as the previous chapter: Objective, Background, and Process. Topics include Expressive Art, Tarot Totem, the Portal, Walking Beside The Shadow, Strength, Higher Power, Vision Board, Interpretive Study, Visual Gratitude Journal, the Meaning Of Life, Tarot Mandala, Boundary Lines, and more. This book can be used on an individual basis, with clients, students, and within a group setting. Matzner also notes that this material can be useful for mental health professionals, or art teachers who use the expressive arts in their practice. It is not a book that one reads straight through (although you certainly can do this). It is much more fun to go through and choose the exercises that will most benefit you or your client, and g oon from there. Quite the reference – keep it close at hand! reproduced in any format without written permission.